Q: Who will be cleaning my home? A: Trained employees of Connie's Natural Cleaning Services in standardized uniform will be cleaning your home. All our employees are required to go through a background check before they are certified to be placed in the field. Q: How will our relationship work? A: We will not ask you to sign a contract because we know we must earn your trust and approval. We depend on open communication and your honest evaluation of our service. We appreciate when you let us know how we can serve you better. Q: What time will CNC's Services be at my home? A: We work seven days a week from 8:00am to 6:00pm. It is difficult to assign a specific arrival time although we will do our best to meet your needs. Q: How do I prepare for the cleaning? A: First, please inform us of all your wants and needs. Please also leave instructions about pet, keys, alarms, or any other specific issues about your home. It is also appreciated if you would pick up toys, clothes, or other household items. Q: What if something is damaged during the cleaning? A: We treat your home as if it were our own home. However, should damage or breakage occur while we are cleaning, CNC Services will make every effort to repair or if necessary, replace the item. When appropriate, insurance claims will be filled. Q: Am I liable for worker's compensation, insurance or employment taxes? A: Many homeowners are not aware of their personal liability regarding work related injury and social security taxes for independent home service workers. No need to worry, CNC takes care of all this for you. Q: Do I need to provide cleaning supplies or equipment? A: No. 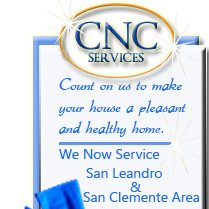 CNC services brings all the equipment and normal cleaning supplies. Please inform us ahead of time if there are any special services needed so that we can prepare and bring the supplies. Q: Do I need to be home when CNC Services comes? A: No, most customers prefer to leave us a key so that we can work while they are away. When not in use, all keys are cross-referenced and secured. If you choose not to provide a key and we are unable to enter your home for a scheduled cleaning, there may be an extra charge. A: Payment is made at the time of service. If you will not be home at the time of service, please leave the amount due by check made payable to Connie's Natural Cleaning Services. We also accept Visa, Mastercard, Discover, and American Express.